Lobuche Peak climbing itinerary starts from Kathmandu with a scenic flight to Lukla and follows the Everest trekking itinerary. Lobuche peak stands just one camp before the Everest base camp so you may visit the Everest base camp and Kalapatthar earlier than climb Lobuche peak. 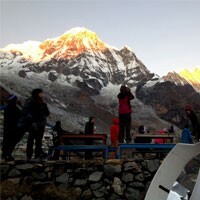 You see the beautiful Everest Himalayan range, Glacier, and more from the top of the Lobuche peak. Frolic Adventure manages the best Lobuche peak climbing itinerary, EBC Lobuche peak climbing itinerary, Everest region trek Lobuche itinerary, and more. Day 01 : Arrive in Kathmandu(1350m.). Upon your arrival at Tribhuwan International Airport in Kathmandu, a representative of Frolic Adventure will pick you up by private transport and take to the hotel. Overnight at Hotel. Day 02 : Full day Kathmandu city tour. 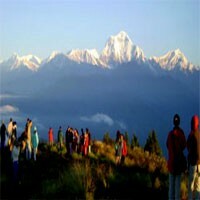 You will have full day Kathmandu city tour this day with a knowledgeable English speaking guide by private transport. You will visit four world heritage sites in Kathmandu. The sites you will visit are Kathmandu Durbar square, Monkey temple, Bauddhanath and Pashupatinath temple. Overnight at Hotel. Day 03 : Fly to Lukla(2885m.) and trek to Phakding(2652m.) 3 hrs. We will take the flight an early morning to Lukla. After flying above the breathtaking green and white mountains, You reach Tenzing-Hillary Airport at Lukla. This is one of the most beautiful air routes in the world culminating in a landing on a hillside surrounded by high mountains. Upon your arrival at Lukla, you meet our other crew members and after some packing and arrangements, you start the trek through the prosperous village of Lukla until you reach Phakding. You only have a short hike today. Overnight at guest house. Day 04 : Trek from Phakding to Namche Bazar(3440m.) 6-7 hrs. After breakfast at Phakding, you walk through beautiful pine forests and then along Dudh Koshi River ending our nature-filled journey at Namche Bazaar. After walking for almost over an hour, you come across the glistening Mt. Thamserku (6,608m) on your right and also experience the serenity of pine, fir and juniper forests throughout our journey. If the weather is clear, you may even catch a glimpse of Mt. Everest peering over the Lhotse-Nuptse ridge. you continue walking until you reach the entrance to Sagarmatha National Park, Namche Bazaar, the gateway to Mt. Everest and main trading centre of this region. On that day you cross five suspension bridges, the last one is the highest. It is an uphill walk from this bridge to Namche Bazaar. If you are on Friday or Saturday here, you can visit the weekly local market. Overnight at guest house. Day 05 : Rest day at Namche Bazar. This is the day for acclimatization. Health experts recommend that need to stay active and move around even during the rest day. There are few options set for this day. You will hike up to Syangboche(Everest view Hotel) from here, you can see lots of white mountain including Everest, Lhotse, Nuptse, beautiful mountain Ama Dablam and many more. After visiting Everest view hotel and enjoying the view, you will return to Namche Bazar. Overnight at guest house. Day 06 : Trek from Namche to Tengboche(3860m.) 5-6 hrs. 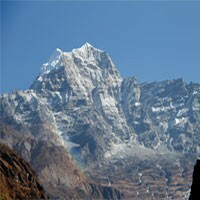 After breakfast, you trek towards Tengboche. It is an easy walk from Namche to Phunki Tenga. Upon reaching Phunki Tenga, you will stop for Lunch and ascend to Tengboche, a village that houses the very famous Tengboche monastery which is the largest monastery of the Everest region. Located amidst the Sagarmatha National Park ( UNESCO World Heritage Site of "outstanding universal value”), it is draped with the panoramic 360-degree view of the Himalayas, including Mt. Everest, Nuptse, Lhotse, Ama Dablam and Thamserku. The monastery opens at 3 pm so you can visit the monastery. just be able to Overnight at guest house. Day 07 : Trek from Tengboche to Dingboche(4410m.) 5 hrs. You will walk through lush forests of birch, conifers and rhododendrons on an easy path. This picturesque trail then dips down to Debuche, crossing the Khumbu Khola River before climbing up to Pangboche. You are able to see the group of Himalayan Thar around here. You will stop at Somare for your Lunch. You will be above the tree line from this day. Overnight at guest house. Day 08 : Rest day at Dingboche. After breakfast at Dingboche, you will hike up to Nagar-Tsang hill for your second acclimatization walk. While walking to the hill, you will see lots of big mountains. You can see the fourth highest mountain in Nepal(Makalu) from here. After your few hours hike up to the hill, you return to the guest house. Overnight at guest house. Day 09 : Trek from Dingboche to Lobuche(4910m.) 5 hrs. You will start the day with a gradual climb to Duglha at the end of the terminal moraine of the Khumbu Glacier. From here, you climb up a steep trail to Chupki Lhara, where you find an array of stones with prayer flags used as memorials to Scott Fischer (American mountaineer) and 10-time Everest submitter Babu Chiri Sherpa who perished on a mission to climb Everest. Next, you continue to the Khumbu Glacier moraine and find facing several great peaks - Khumbutse, Lingtren, Pumori and Mahalangur Himal. The trail then easy as you follow the valley to Lobuche. Overnight at guest house. Day 10 : Trek from Lobuche to Gorakshep(5181m.) and hike up to Everest base camp(5364m.) 6-7 hrs. You will take the trail to Everest Base Camp this day. Continuing straight ahead, you come across the Indian army mountaineers' memorials. The path from here can be misleading; hence it is important that you follow our guides diligently. The walk is strenuous due to thin air in the high altitude. You will pass through rocky dunes, moraine and streams before reaching the Everest Base Camp. Upon reaching the Everest Base Camp, you see tents of mountaineers in spring that stand out in bright colours against the monotony of grey surroundings then you trek back to Gorakshep. Overnight at guest house. Day 11 : Visit Kalapathar(5550m.) and trek to Lobuche(4910m.) 5 hrs. You need to prepare for an early morning departure, amid pre-dawn darkness and cold temperatures (-10 to -14 C). Plus, there is always the potential for chilly winds which are quite common. Familiar peaks such as Lingtren, Khumbutse, and Changtse tower to the east even as Everest begins to reveal itself. But, it is upon reaching Kala Patthar that you get to see 360-degree up-close and formidable views of Mt. Everest. take pictures, enjoy the magnificent mountain panorama, and then return back to Gorakshap for your breakfast and trek back to Lobuche. Overnight at guest house. Day 12 : Trek from Lobuche to Lobuche east high camp(5400m.) 3-4 hrs. From Lobuche, you trek towards Lobuche base camp. After walking some distance on a relatively flatter plane, the path to the Lobuche Base Camp gets steeper and rocky. you move forward along the Lobuche Glacier while enjoying great views of Ama Dablam, Cholatse, Pokalde, Thamserku, Kantega and the other Himalayas. From the base camp, you continue on a rocky moraine path to reach the High Camp. After reaching there, we set up our camp, take lunch and rest. For the climb, we usually will be climbing on rock surface for up to around 5770m. After that, you climb on ice and use ropes when necessary. However, the use of the rope and the length depends upon the season and the crevasses. Fixed rope is used most of the times whereas man rope is used when required. The climbing leaders will decide what is best for when. Overnight at tented camp. Pre-Climb Training: Our guides will provide training on peak climbing techniques and the proper ways of using climbing gears such as the ice axe, climbing boots and crampons, harness, ascender, etc. The training will also include using ropes to go up and down. We strongly believe that the training experience will boost your confidence and climbing skills to increase the chances of scaling the summit as well as to fully enjoy the climbing experience. Day 13 : High camp to Summit(6119m.) and back to high camp 8-9 hrs. You need to wake up early today at around 12 to 1 am and have our breakfast before the climb. It is important you reach the summit before noon because in the afternoon the strong winds in the high lands might become a barrier for a successful summit. You will most likely be walking on rock surface up to around 5700m after the climb on ice. You use both fixed rope and man rope as per our leader’s instruction. The climbing surface as well as the length of the rope and depends on the time of the season and the crevasses. Lobuche East offers more panoramic views of the mountains than any other trekking peak. From the summit, you get to enjoy magnificent views of Everest, Lhotse, Nuptse, Ama Dablam, Cholatse, Pumori, and many more. We spend some time at the summit celebrating and taking pictures, then you get back to the High Camp again for an overnight stay. Overnight at tented camp. Day 14 : Trek from High camp to Pangboche(3930m.) 6 hrs. After breakfast, you trek downhill from Lobuche High Camp and join the Everest Base Camp route at Lobuche again. You will reach to Thukla for Lunch. On the way to Pheriche, you get to enjoy magnificent views of Mt. Ama Dablam in the distance. From Pheriche, you continue to Pangboche. you trek down through the hillside blanketed by juniper bushes. Overnight at guest house. Day 15 : Trek from Pangboche to Namche Bazar(3440m.) 5-6 hrs. From Pangboche, you cross to follow the same trail with the same view that you passed on the way up. After crossing Tengboche, you start descending towards Phunki Tenga and stop for Lunch. After lunch here, the trail ascends to Kyangjuma and an easy trail leads to Namche Bazar. Overnight at guest house. Day 16 : Trek from Namche Bazar to Lukla(2885m.) 7 hrs. The trail descends steeply downward so you need to walk carefully. After crossing the suspension bridges over the fast flowing Dudh Koshi and its tributaries, the trail becomes more level and natural. After your arrival in Lukla, you stretch those sore legs and recall the experiences of the last couple of weeks and celebrate of the trip with last night mountain stay. Overnight at guest house. Day 17 : Fly to Kathmandu early morning. You will catch an early morning flight to Kathmandu. After reaching Kathmandu, you can take a rest. You will be invited for farewell dinner this evening by Frolic Adventure. Overnight at Hotel. Day 18 : Free day in Kathmandu. You Have a free day for your final souvenir shopping and hang around Kathmandu. Day 19 : Departure to the International airport for your final departure. We will provide private transport to the International terminal for your final departure to your home.